Amazon is one of the fastest growing retailers in the world. This isn’t surprising, given the low prices and excellent buyer protection and customer service that the company is known for. Moreover, with their Prime Membership expanding and offers of free shipping proliferating, more and more people are turning to Amazon for all their purchases. Furthermore, as the company becomes more widely used, Amazon gift cards are an increasingly popular gift, so you can put your stocking stuff toward a new mattress. As a result of this boom, a greater number of sleepers are buying their new mattress from Amazon ever year. In order to help out our Amazon-addicted friends and readers, we’ve put together this guide to the best mattresses on sale on Amazon right now. 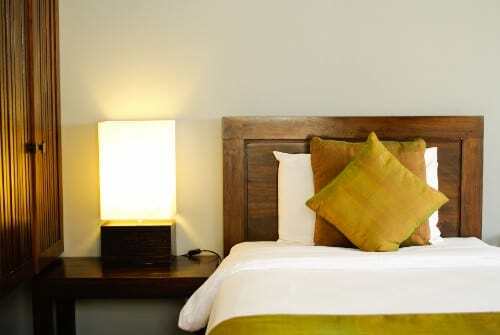 Dreamfoam is a sister company to the well-known online retailer Brooklyn Bedding. They’ve been producing great mattresses for a while now, and the Artic Dreams mattress is easily one of the best mattress options on Amazon. The Artic Dreams mattress is 10” thick and made from a gel-infused memory foam. It comes with a ¾” quilted top layer, 3” of Energex foam, and 6.25” of base support foam. All of these materials are of a very high quality, so you can be sure that they’ll wear well and hold up through the years. Energex foam is a particularly exciting product. It shares a number of qualities with latex, but provides more push back and better support. Artic Dreams has a true neutral firmness, coming in at a 5 on a scale from 1-10. As a result, it’s best for side sleepers and light-to-average sized sleepers. Heavier sleepers might experience more sinkage than they would like. The mattress is made in the USA in Phoenix, AZ. eLuxury Supply offers one of the most highly rated mattresses on Amazon. It’s made from two layers of foam, a 3” top layer of gel-infused memory foam and 7” of high density support foam. Nearly everyone who has purchased this mattress from Amazon says they would recommend it to others. 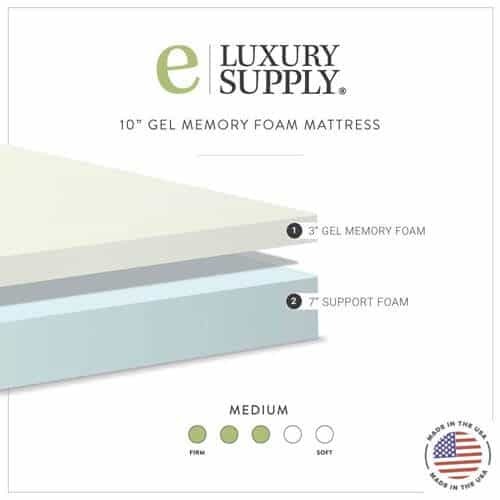 The eLuxury Supply mattress is a medium-firm option, coming in at a 6.5 on a firmness scale of 1-10. This allows it to approach the “universal comfort” that many online and foam mattress retailers are aiming for today. It has a moderate amount of sinkage, along with excellent pressure relief and body contouring. The company also donates 1 mattress for every 45 they sell, which helps make the world a little bit of a better place. The Tuft & Needle is one of the most popular mattress online today, both directly and through Amazon. It’s designed with two layers totaling 10” thick. Like many other mattress retailers, Tuft & Needle aims for universal comfort, and their mattress has a firmness level of 6 out of 10. The Tuft & Needle mattress uses a polyurethane foam unique to their company, which has qualities in between memory foam and latex for a unique feel. The next awesome mattress on Amazon is the Brentwood Home Gel. Brentwood constructions their mattress in Los Angeles, CA, which helps them stand apart from many of the other mattress retailers on Amazon. The result is that they are able to offer their mattress at a much lower price than other companies, who have to pay their manufacturer and thus have more overhead to contend with. Brentwood offers a variety of thicknesses and firmness levels. The thicker a Brentwood gets, the softer it gets. The gel mattress comes in 9”, 11” and 13” thicknesses. Our favorite is the 13”, which produces a deep hug and contour that is classic memory foam response. The mattress does an excellent job of contouring to your body. However, if you want less sinkage then their thinner models are also excellent options. Zinus is a very diverse mattress company that has three great options on offer at Amazon. The mattresses are from 8-12” thick, and, like the Brentwood, the thicker the mattress the softer it is. The 8” model is the firmest product they offer, the 10” model falls somewhere in the middle of the firmness spectrum, and the 12” model is their softest mattress. Side sleepers will prefer the 12” model so they can get the sinkage and hug they need to access the support they require. Whichever Zinus mattress you go with, you can be confident that you’ll get a great mix of sinkage, hug, contour, support, and cooling. The result is a cost-effective mattress which creates a great value for its buyers. The Shiloh, from Sleep Innovations, has gained a sizable following during its 3-year lifespan. It measures 12” thick, and is constructed from two layers of foam. The top layer is memory foam and measures 2.5”. The top layer rests on 9.5” of support foam. We found that this combination of thicknesses and foams does a good job of providing the top-level support that helps sleepers feel comfortable, while at the same time creating the necessary transitional support to ease sleepers on to the base layer. This is one of the only mattresses that is made from two layers that we think will be a good value for heavier sleepers, as the deep compression support the Shiloh provides helps to make it second to none when it comes to affordable, two-layer memory foam mattresses on Amazon. The Signature Sleep mattress is one of only a few hybrid mattresses offered on Amazon. While they have a strong menu of offerings, the contour 8 inch is one of the most popular. As of this writing, this mattress has garnered over 6,000 reviews. When you consider the price of the Signature Sleep hybrid, you can understand why so many people have become fans. It costs a mere $199 for a queen size mattress. The Contour 8 combines pocketed coils with foam and quilted top layers to offer a comfortable, supportive, and cool mattress with excellent bounce and responsiveness. The Contour 8 is a great example of what you’re looking for in a hybrid mattress. The foam and quilted top layers offer support and softness, while the coils provide cooling and bounce. Moreover, the mattress can be flipped, which means that you can get some extra life out of the mattress, making its already low price point an even greater value. The best mattress for your friends might not be the best mattress for you. We’ve put together this handy chart to help summarize the information in our reviews above. Use this chart to help narrow down your search according to the price, amazon score, or design of the particular mattresses you’re interested in.